1. Moving drained my life force. Packing up one’s entire domicile is a hideous undertaking. Not only do you have to spend hours carefully packing stuff like wine glasses and the trinkety crap from the mantel–you also have to worry about getting the curtain rods down (and how do you pack/transport curtain rods? or brooms for that matter? things that don’t fit in boxes drive me MAD) and taking pictures off the wall and cleaning out that weird dark closet under the stairs where the old litter boxes sit silently mouldering. There are so many deeply annoying aspects to moving. I barely managed to survive them this time. All my energy went into staying sane for the few weeks before the move and now I’ve got nothing left. I’m a lifeless husk of my former self. 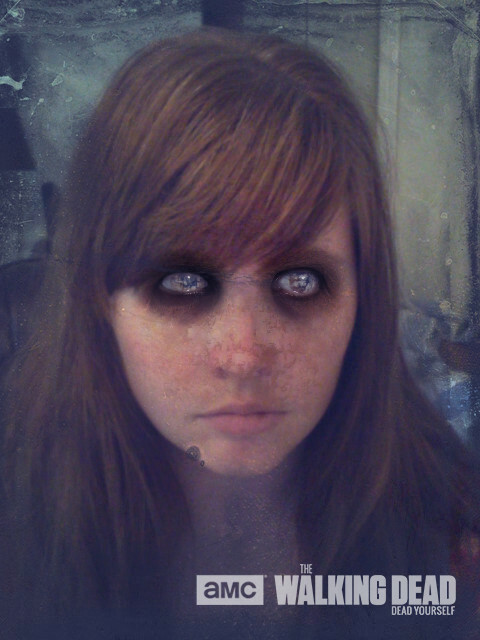 I’ve turned into the Autumn-zombie. Confession: I spent 45 minutes playing with the Dead Yourself app. In the end I couldn’t zombify my mouth cause it was too scary and I wanted to cry. 2. There are too many TV shows. Currently I am watching Buffy, Angel, Bones, New Girl, and Scandal. I recently finished the new Arrested Development and Firefly. Y’all. I can’t stop streaming. Send help. How did Joss Whedon make a show that is half campy horror and half profound exploration of the meaning of life? I’ll never understand. Seriously, why is TV so good? I have spent so much time binge-watching on Netflix that my eyeballs ache in bright sun and there’s an Autumn-shaped imprint in my corner of the couch. I have lost the will to make my own food (thanks for keeping me alive, GrubHub) or wear real clothes. I just need to finish the shows I’m watching now and then I’ll be good. Well, unless I start The West Wing. Or Alias. Or The X-Files. I heard those shows are dope, y’all. 3. Our new place needs some serious TLC. Check out this toilet. I’m a little afraid to use it because I suspect it’s a secret portal to the 70s. 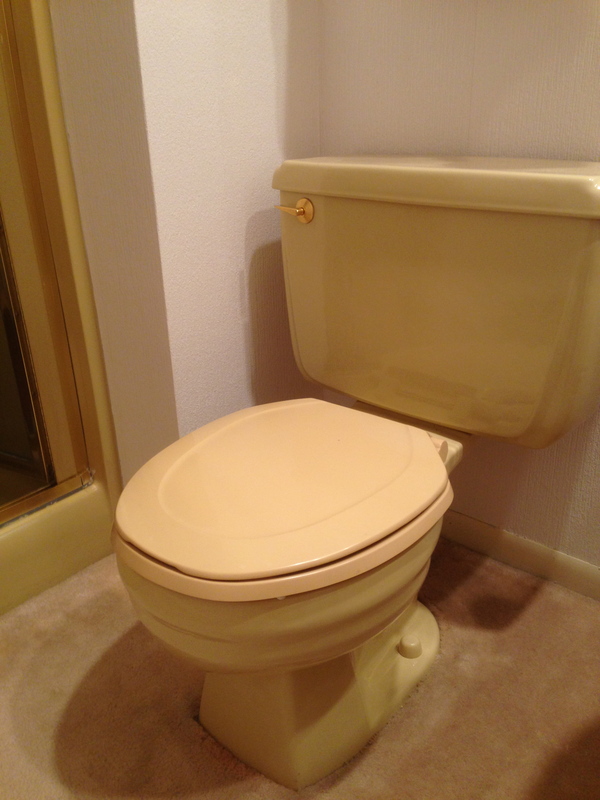 Can you imagine speeding through time and space and arriving in the 70s via toilet? Not. Fly. On the bright side, it’s not avocado green. I think that would be marginally worse. As you can see, there is also carpet in the bathrooms, which registers like a 7.0 on the Ick-ter Scale. Plus the paint on all the walls and trim is dirty and faded and sad, and the “finished” basement is like a dungeon, if dungeons had orange-and-yellow carpet. Don’t get me wrong, I actually like this place so much more than our last one. It’s super spacious and closer to work and in a great neighborhood and we’re saving *buckets* of money on rent. We can bike to work every day and we have a lovely patio and lots of natural light. The kitties adore it. But it’s old and outdated and it will require some serious elbow grease (guys, by the way, wtf is elbow grease?) before it can be attractive and comfortable. And the problem is, most of the painting and decorating and camouflaging of yellow toilets needs to be done before I can fully, truly unpack. The thought is overwhelming. I’m completely paralyzed. Just…I can’t even. Hand me the remote somebody. I feel exactly the same way about our new place. These are exactly the same reasons I haven’t truly unpacked our books yet or put more than three pictures up on the walls. We still don’t have curtains in the kitchen or our bedroom, but I figure I might as well not bother with curtains until the kittens are old enough to reach the window sills without climbing up the drapes in the living room… Basically, I’m with you in spirit! I’m also depressed by the thought that, by the time I finally get around to doing all the things I should do, we’ll most likely move somewhere else! Aggghh Sarah, I know. I’m afraid to get too invested in this place in case we have to leave it in like, a year.